This community is for all furries with pets! By pets we mean your little feathered, scaled, 4-legged, or aquatic pals. We love seeing pics of your pets or you with your pet! Fursuit pictures with your pet are highly encouraged, but not required. Please make a post when you join. This is a clean community so nothing over G here. 1) Be nice. We're all adults here or if you aren't, act like one anyway. 2) This is a G-rated community. We don't want to know about your bedroom. 3) ALL pictures need to go under cuts or just shown as html links. If they aren't then your post will be deleted. If you need help let us know. 4) Try to keep posts on topic. If it has to do with pets its probably ok, I'm not a huge stickler. But I don't really want this community to be a big advertising hub. It may take a little while for your membership request to go through. I'm usually online several times a day so it shouldn't be more than 24 hours. 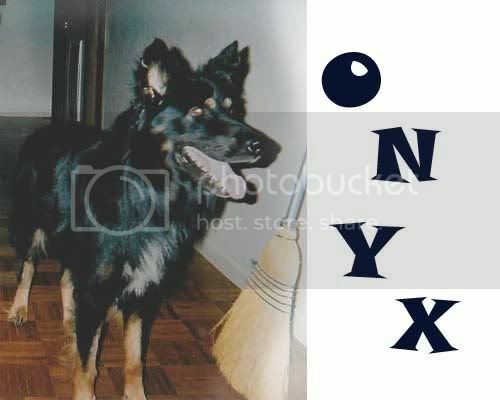 Onyx- My monster dog, Onyx. He's a long coated German Shepherd, who was nearly put to sleep because he didn't fit AKC standards and couldn't be sold. That white stripe on his chest, and the fact he's larger than normal nearly got him killed. He's pretty sure that he isn't a dog, though. He spends a majority of his time watching TV and has become more of a brother than a pet. Pet of the month! Also we're working on a getting a pet of the month started. There will be an entry post soon for you to post for it. The pet will be voted for by the members, and the picture of the pet will be put here, and hopefully there will be a small prize for each month's winner!